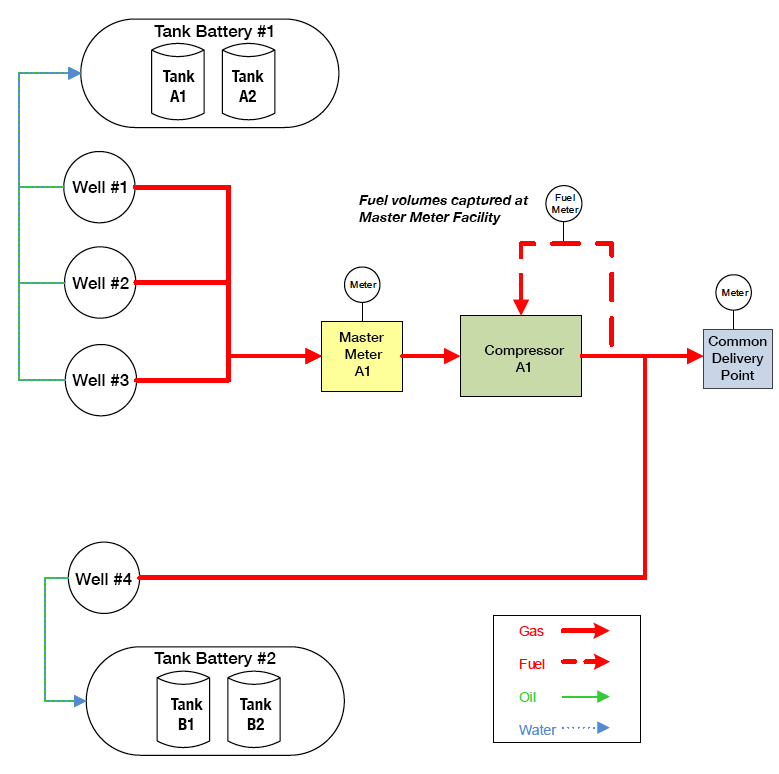 Your operation may utilize delivery system diagrams to varying degrees, if at all. We here at Total Stream Systems are big advocates of creating and maintaining visual representations of your delivery systems. They serve multiple valuable functions, require little to create, and are simple to maintain once they’ve been developed. This article will cover why you should have them, the tools necessary to create them, and good practices to adopt in utilizing them. It allows you to quickly see and process pertinent information for your field. Compare that with reading through spreadsheets or other documentation, then attempting to mentally construct a visual. It saves time, it reduces errors, and it’s easier for your brain to process the information. It gives you the ability to accurately allocate your production to regulatory and revenue accounting. It will allow you to see all contributions and how they’re a part of your allocation system. It allows engineers and supervisors to quickly diagnose production fluctuations. If you have engineers that are managing hundreds of wells, they likely won’t be able to recall how every field is set up. If they have a diagram, they can quickly glance at a field and know what factors might be causing fluctuations in your production. It shows what equipment is tied to facilities, and what relationships from the field are tied to your database. This becomes important in knowing who should be charged for what fuel usage, equipment costs, and other costs. It also becomes a great tool to use as you set up relationships in your database. Take a moment to look at the diagram below. Wells #1, #2, and #3 contribute oil (and water) to Tank Battery #1, which has 2 tanks. Well #4 contributes oil (and water) to Tank Battery #2, which has 2 tanks. There is a compressor that uses fuel, which should be allocated to wells #1, #2, and #3. Well #4 delivers gas directly to the common delivery point, without going through a compressor. You can download some example delivery system diagrams we’ve created using different tools to help you visualize how you might create your documents. Where gas is vented or flared (if that’s something you track). We recommend creating a system that details all necessary information. When filling in the data, the more thorough you can be, the better. If you’d like a template document to help you get started, contact us and we’d be happy to provide you with one, as well as instruction on how to use it. Once your document is complete, you’ll need to create second document describing the relationships between your assets. For example, you’ll need to relate facilities to their tanks, meters, and wells. If you are utilizing Total Asset Manager™, a report can be run that will give you relationship information after the data has been imported. This is important in verifying the accuracy of your relationships, which in turn affects the accuracy of your reports. If there are multiple copies of the same diagram floating around your office, you’ll never know which one is up-to-date and accurate. That’s why it is important to keep your diagrams as a single source. What you use to make that document accessible depends on your office environment, but some options might be Microsoft SharePoint, your company intranet, or if you’re utilizing Total Asset Manager™, there is a document management tool embedded in the software that will allow you to store your documents. The importance of having a documented system of contributions and distribution for your products can’t be emphasized enough. Diagrams of your delivery systems have many uses and benefits that will save your operation time, avoid confusion, and reduce errors.